Whether you’re moving offices or are in desperate need of a revamp, discover our collection of contemporary meeting room furniture to give your company meeting place a slick overhaul. From executive walnut boat shaped meeting room tables to our popular bench table sets giving a more relaxed setting for meetings, we have a range of styles to suit every business environment. The popular diner style units or meeting booth sets as they are also known, will add serious style to your office while providing a compact space for meetings that may have otherwise been deemed too small for a traditional meeting room table. Used in multiples, these can be used to create numerous meeting points which would be beneficial for different departments. This style of furniture is designed to encourage collaboration, improve productivity and inspire creativity. Shop the Meeting Booth here. 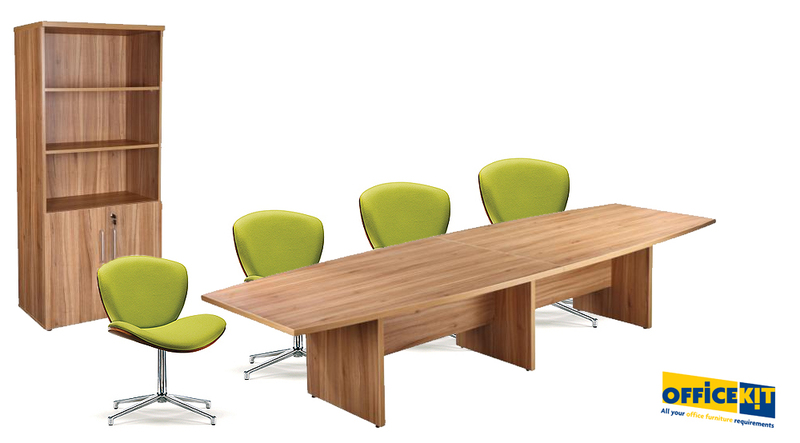 Ideal for the modern boardroom, these stylish walnut shell chairs are upholstered in a fresh apple green and feature polished aluminium 4 star base. As you can see pictured, we’ve teamed these stylish chairs with a complementing walnut Boat Shaped Boardroom Table and the executive Storage Cupboard Bookcase. Our top tip is to team bright colours with premium materials such as walnut furniture to ensure a professional finish. Shop the Shell Chairs, Boat Shaped Boardroom Table and Executive Storage Cupboard & Bookcase. These stackable meeting chairs are practical and comfortable as well as ideal for adding subtle pops of colour into a space. These chairs are also stackable making them a perfect space-saving solution. Our circular meeting table is another space saver for smaller meeting rooms with a diameter of 1200mm; available in crown cut oak or American black walnut. 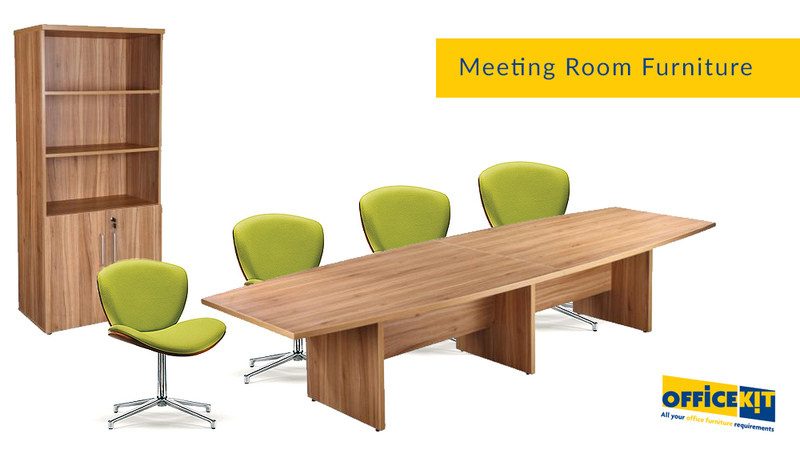 Shop the AC33 Meeting Chair and Circular Meeting Table.